Robert Minard Garrels revolutionized the use of experimental physical chemistry data for addressing problems in geology and geochemistry. His work helped bring about a new understanding of, and appreciation for, the use of physical chemistry methods and data in the earth sciences. 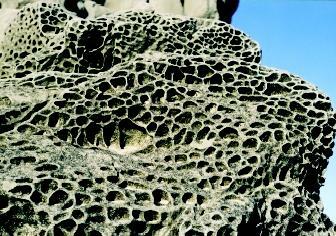 The weathering and dissolution of rocks and the chemical reactions involved were among the geochemical problems studied by Robert Garrels. Mineral grains from the pockmarked, honeycombed surface of this boulder on an Oregon beach are slowly being transported into the ocean. Garrels was born in Detroit, Michigan. Although he spent his early years in southwestern Virginia, where his father was a chemical engineer, he attended high school in Michigan. In 1933, Garrels entered the University of Michigan to study chemistry. However, he switched majors to geology and earned his bachelor's degree in 1937. While attending graduate school at Northwestern University, Garrels renewed his interest in chemistry and combined his interests to study the origins of lead and zinc deposits in Newfoundland, Canada. He used electrochemical techniques to determine how complex ions form in aqueous (water) solutions—a topic that was to recur frequently in his work. In World War II, Garrels joined the U.S. Geological Survey. From 1945 to 1988, he worked at various institutions, including Northwestern University, Harvard University, the U.S. Geological Survey, the Scripps Institute of Oceanography, the University of Hawaii, and the University of South Florida. Garrels enlisted his students and colleagues to conduct basic research on many geochemical problems. For example, the Scottish geologist James Hutton had proposed in the 1700s the existence of a "rock cycle," in which rocks worn down by wind and water are carried into the seas, where they form new rocks. Garrels studied the chemical reactions between minerals and sea water in this process, applying actual data and calculations to the theory. His work helped explain how fresh water becomes sea water, and helped lay the foundations for studies of how the Earth's climate changes over time. SEE ALSO Fresh Water, Natural Composition of ; Fresh Water, Physics and Chemistry of ; Hutton, James ; Sea Water, Physics and Chemistry of ; Weathering of RO CKS . Garrels, Robert M., and Charles L. Christ. Solutions, Minerals, and Equilibria, 2nd ed. New York: Freeman, Cooper & Company, 1982.